Ian has just found an apartment for his stay in Poland. Of course, he did get a little help from his mom and his mom got some help from friends in Poland — including Beata, who once visited Tuscaloosa before Ian was born and who met him in New York last summer. Anyway, this new apartment sounds great. 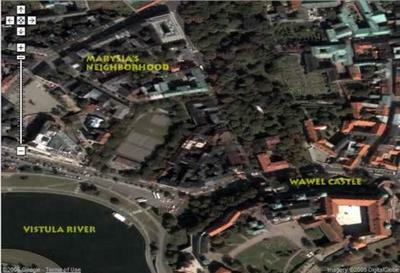 A little two-room flat in the heart of the city, just two blocks from legendary Wawel Castle. Apparently, the apartment is owned by an Irish individual. It’s been recently renovated and may even include access to phone and Internet service! We were saddened to read in the Tuscaloosa News yesterday that Ian and Marysia’s doctor, Dr. Jimmie Clark, had lost her fight with breast cancer. Dr. Clark had been Marysia’s doctor for years and she cared for Ian from his very first day of life — coming to see him in the hospital to give him his first physical examination. Even while undergoing cancer treatments, she was never less than cheerful and nurturing. She may have been the most empathetic doctor I have ever met. We greatly mourn her passing. TUSCALOOSA | Those who knew Dr. Jimmie Clark said that she had a way with her patients — even the children. Cindy Dedmon, one of Clark’s partners at Tuscaloosa Family Practice & Obstetrics, said children who ordinarily would enter a doctor’s office screaming would greet Clark with a hug. Clark died Thursday morning after a yearlong battle with breast cancer. She was 39 years old. Her funeral will be at noon Tuesday at Bailey Tabernacle. Clark, who was the first black president of the Alabama chapter of American Academy of Family Physicians, was diagnosed with breast cancer in July 2004. Dedmon said Clark insisted on working even as she underwent chemotherapy, a mastectomy and radiation treatment. The cancer went into remission, but in early May doctors discovered that the cancer had spread to her liver. Dedmon met Clark in 1992 during Clark’s residency. 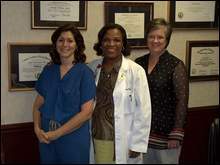 Dedmon was Clark’s attending physician and instructor for three years, and they went into practice together in 1996. “Dealing with the illness wasn’t hard, because as a doctor I was treating her,” said Dedmon, who was Clark’s physician in the final weeks of her life. Clark’s husband, Curtis Travis, a field director for the Alabama Education Association, was at her bedside during the final days. Her children, Ava, 6, and Justin, 3, remained close to her as well. Susan Clements, a patient and longtime friend of Clark’s, said she has seen Clark’s personality reflected in the children. Clark also was a source of comfort not only to patients and family, but to medical students as well. Tracey Miles was a student when Clark was a resident, and the two became best friends. Miles said she has used Clark’s career as a pattern for her own. Miles compared Clark’s battle with cancer to the biblical account of Job, a man who lost everything but maintained faith in God.